WE'RE ALIVE ALTHOUGH IT WAS TERRIBLE. We were disconnected from the world for 12 hours and darkness fell on Chichibu. The tremors, although not as big as the initial ones, were still felt all through the night. Everything seems to be back to normal now (in Chichibu). Finally March!!! January and February already behind us means spring! In Japan spring is always associtated with the beginning and the end of a school year. It happens at the end of March and the beginning of April when cherry blossoms are beginning to appear. March also means less work for us. The schools are preparing for the the end of the year and students are busy with differetn activities, reharsals, exams, and so on. Some of the schools, especially the smaller ones, do not need us to come in March at all. 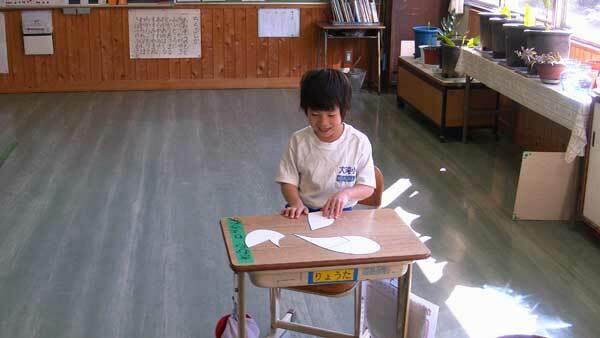 One of such schools, for me this year, is Ohtaki Elementray School (Ohtaki Shogakko) - not so ordinary school. 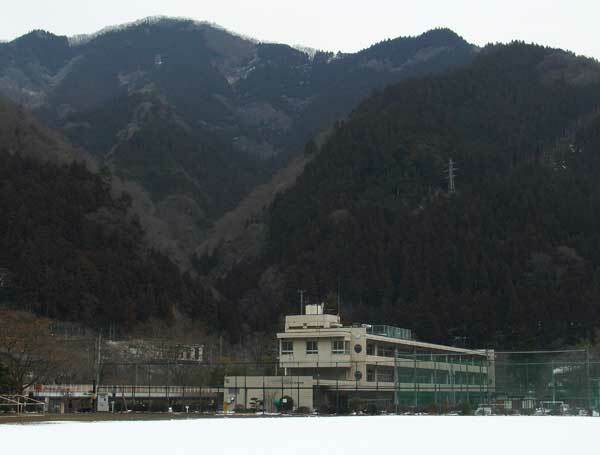 Ohtaki Elementary School is situated deep in the mountains, in the middle of Okutama-Chichibu National Park and it is the last remaining elementary school in the district of Ohtaki. Not so long ago there were more schools in the past - 3 or 4 elementary and 2 or 3 junior high schools. Today there is only 1 elementary school and 1 junior high school left and who knows for how long. 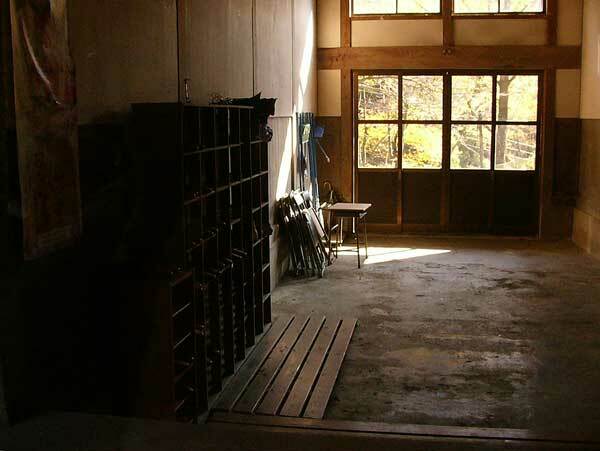 The school can be reached in 50 minutes from the city of Chichibu these days via the national highway 140, but in the past it was a long, long journey. 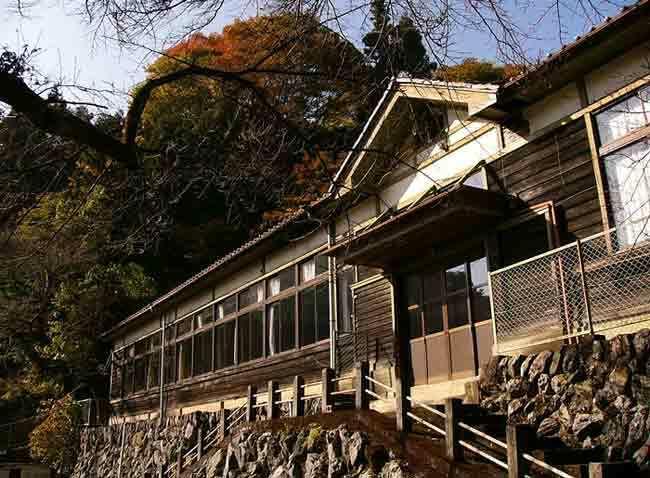 It is situated on an old route along beautiful Arakawa river that was used in the past by silk traders to transport the famous Chichibu silk to the other side of the mountains. And unless there is a huge change in our society the number will continue decreasing every year until the school will have to be closed down. Ohtaki Elementary School hallway during a break between classes. 1 person in the first grade - world's smallest class. Unfortunately, this is not a story of a one school. 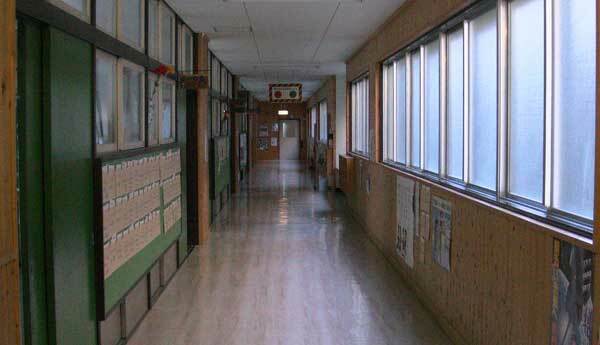 In Japan, there are schools like that all across the country. Mostly, these are schools located in the mountains and since the mountains are from north to south and west to east, these schools are everywhere. Very often schools that already have been closed down are seen in the villages. The number of those schools is actually much larger that the number of schools still remaining open. Also, the villages where those schools are located, the villages that not so long ago were full of life, also seem empty. Some small villages or hamlets are completely empty. It is not uncommon to come across a hamlet of about 10 houses without anybody living there anymore. Only empty houses and overgrown fields are reminders of times when people lived there and it was not such a long time ago. On the other hand, the villages that still have inhabitants, have the age average of about 60 and in many cases it is the last preserved generation of the "old" culture, the culture that has been developing for centuries. When these people leave this worl, there is noone who could pass their knowledge forawrd to the next generations and keep the culture alive. And the villages will be turned into parks where people from the cities will be able to come on the weekends to look at beautiful and colourful flowers. Well... the future of these village schools is pretty obvious. Still the locals are doing everything in their power to change it somehow. Who wants to see the place where their families have lived for hundreds of years be turned into a park. One approach by the local governments is education. Besides the conventional subjects, children are taught the local culture in music, dance and other forms of regional art. Not only study about it, but also do it. And they learn about it from the local experts who are engaged in the education. The children are also taught all the practical aspects of the life away form a city. They are taught simply how to grow food and how to be independent from food producers. The small scale agriculture is not new in Japan, but unfortunately it is done by the older generations. And these people are used to educate children hoping that some of them will decide to stay and live in their village rather that to move to a large city. But despite all these attempts to preserve the culture and save the villages, the future looks dark. Even though the kids gain the necessary education and complete the local elementary and junior high schools, the higher education must be obtained in a large city. And who wants to then return to the mountains to grow potatos or rice? 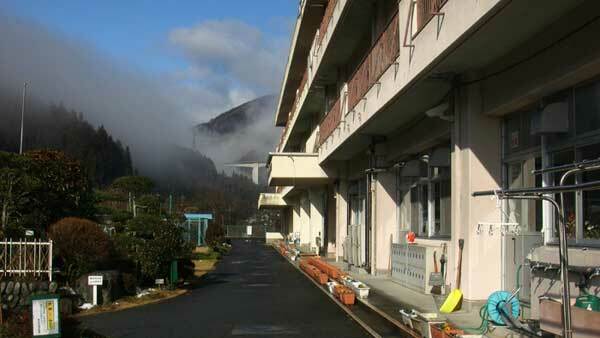 An elementary school in Hokku, a mountain hamlet in Gunma prefecture, not far from Chichibu. The school was closed down in 2002 or 2003 because there were no students left in the hamlet. The school in its last year saw 1 (one) student. There were 3 teachers with him. After the student graduated, the school was closed down. At the same time as villages disappear, the towns become cities and cities become megacities. The will to freedom and independence is being crushed. The skills to live freely or even survival skills are quickly disappearing and it seems like our common goal is to become a slave even though we think slavery is bad. It seems like what we really want is to work as a slave and we want it because our biggest dream is not to live happily, but to have, to own. And it is happening around the world. The world's population's goal is, first, to be molded by the system through schooling when young and then to willingly become a slave after molding at a school has been achieved. And all that not even to be, but to believe that we are owners of a dream plastic house with a dream plastic/steel car parked in fron of it and a possibility of being able to, once a week on a holy Sunday, to go to a shopping mall to spend the money, we work for so hard, on more plastic to add to "our" plastic home. And here comes a question to my mind - do we really want this? And if we are convinced we do, do we need it to live happily? The school has 19 students this year and from next there will be 17. In the school year 2017 - 2018, if it remains open until then, there will be 2 (two) students. And who would think that once, not so long ago, the school had over 300 students. 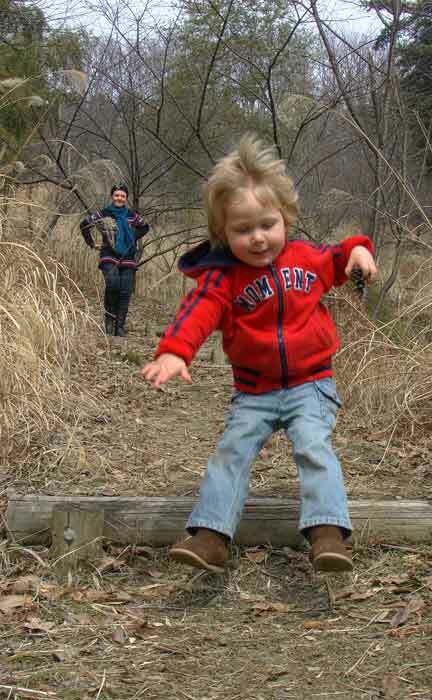 We have lived in CHichibu for almost 2 years now still discovering new and interesting spots in the area. Recently, we found out about a deer park in a local shrine in a neighbouring town, Ogano. Ogano (小鹿野), in Japanese, means "small deer field" and there is no shortage of deer in the surrounding mountains. But we had no idea about the shrine there. The place reminded us of of another deer park, in Nara city, where we lived some years back. The deer park in Nara, however, is a major tourist destination being an ancient capital with a large number of beautiful and famous shrines and temples surrounding the park as well as freely roaming deer around the city constantly searching for tourists and the food. 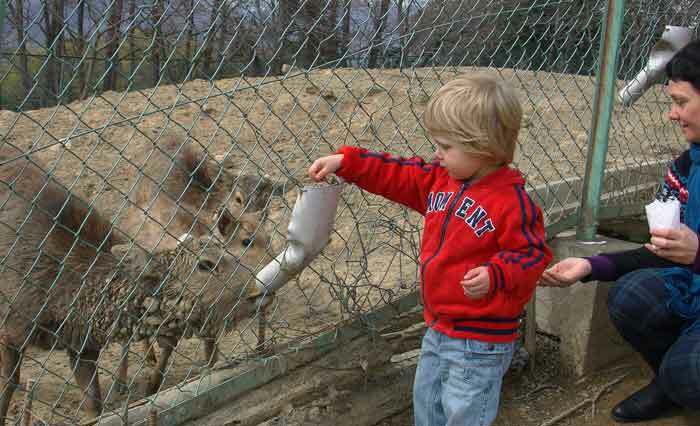 The Ogano deer park might not be as big and famous as Nara park, but it still is a very interesting place especially for a 3 year old. Besides it is a very relaxing place being usually empty as the occasional visitors are the local people. The mountains in this area are full of deer, which is Sika Deer (Nihonjika ニホンジカ). It is a Japanese deer, but it closely resembles the European deer. 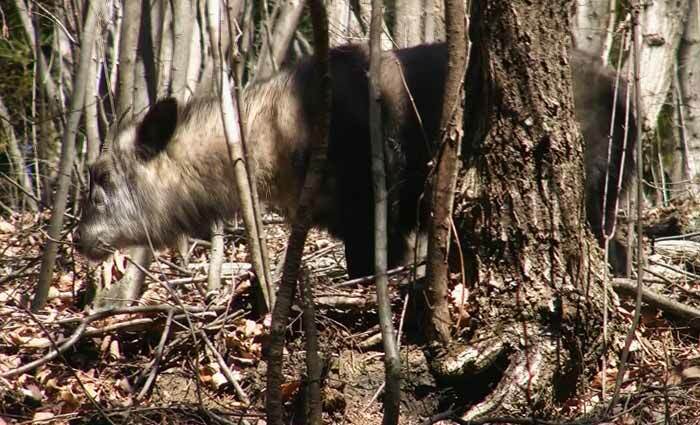 There is also another type of animal in the local montains and it is Japanese Serow (Nihonkamoshika ニホンカモシカ). And although, in Japanese language, it is a deer, it belongs to a different family and it is a goat-antelope. According to the locals, there is a large number of Japanese Serow in these mountains and they are usually found on the steep, rocky slopes. Theys are solitary animals and are rarely seen in groups. And being quite shy, they do not like to come out and show themselves to humans. Japanese Serow - a local mountain goat. We have now officially entered the early spring season called Sankanshion (三寒四温). It litereally means "3 days cold and 4 days warm" and it is quite accurate in describing the weather at this time of a year. ...and the same valley 3 days later. 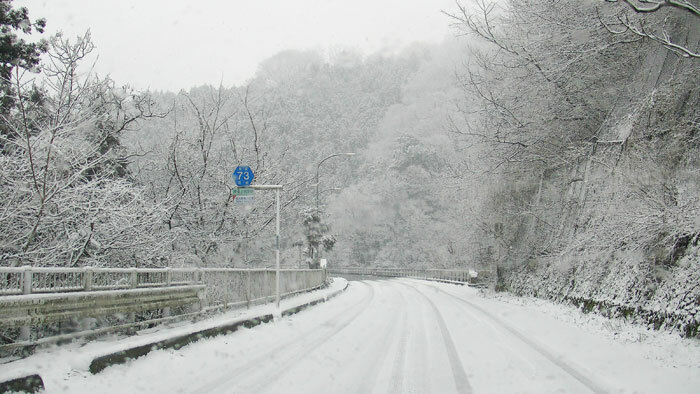 Exactly a week ago more snow fell in Chichibu. This time we woke to discover 25cm of fresh now outside. It was amazing. Unfortunately it was 5cm short of closing schools. From the early morning hours, we could watch the great effect of the Japanese communal neighbourhood works. All those who did not have to be at work or school in the early morning were outside clearing the snow. It was done with such great effect that when leaving to school we were able to drive on niceley cleared roads. It was incredible! Spring doesn't necesarily means warm. Evenings and mornings can still be chilly and with occasional Siberian front, the overnight frost is not uncommon. And for this reason every house in Japan has some kind of a heater whether it is oil, electric, gas or wood. 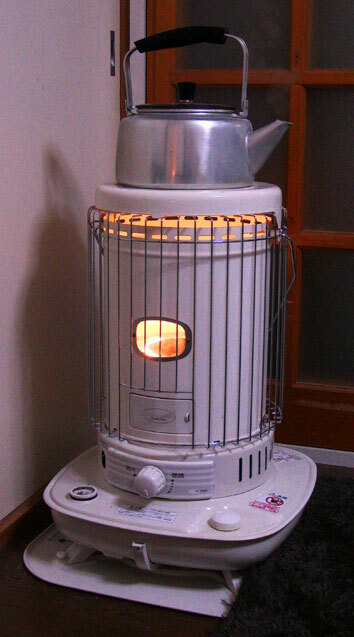 Our weapon to fight Japanese winter cold has been an old school oil stove, which is simple and very effective. It is a necessary item in getting through a Japanese winter and it has been our great winter friend for years. We couldn't imagine winter without it or any heater. Unfortunately, the Japanese houses, with an exception of those in the far north parts of the country, have neither central heating or insulation and are not well sealed and local heating is necessary. It doesn't have to be freezing outside to be very cold inside. When it is about 0 degrees (Celsius) outside, it is only a little bit warmer inside. The temperature in our washroom can go as low as 0 degress. And although there is no shortage of space technology oil, electric or gas heaters, the oil is the preffered fuel since it is much cheaper than electricity and gas. Outside the large cities, it is common to see older houses heated with the wood stoves, but they are slowly disappearing, however are still widely available. Unfortunately, our house is not equipped in a wood stove and the next best choice for fuel is the kerosene. Our old school stove is very simple and effective. The local market is drowning in high technology oil stoves that can even sing you "Happy Birthday! ", if necessary. But the old style stoves are still produced and widely available. They are very popular and irreplacable. And they do not only heat up, but also serve as humidifiers and keep water hot for tea. Japan is known as a “country of extremes”. What I always liked about this place is the coexistence of past, present and future. The latest technology can live in harmony with tradition. The invention of new does not mean the end of old. There is this phenomenon that probably can only be seen in Japan or at least to that degree. Where else could we see a person on the street dressed traditionally not to perform, but to simply look good or a farmer using a sickle in the field and who lives in an old wooden traditional house heated with a wood stove and who also has the newsest model of I-phone and the newest model of a hybrid Honda parked in fornt of that house. The Japanese do not believe that technology may make our lives easier, but to have the technology we do not necessarily need to ged rid of the tradition. And most importantly old does not necessarily means bad, something that is slowly coming back to the western society has never disappeared from the Japanese society. There is always choice. Wow! It's been over 2 years since we've updated our site. 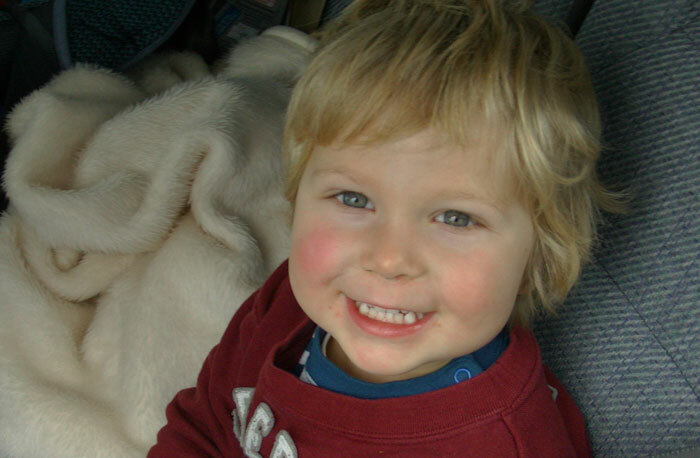 We were still in Canada then and Olek was 8 months old. Wow! I've just realized how long ago it really was. We are 2 years older now making Olek almost 3 years old. No wonder he keeps saying, "I'm a big boy". It's February 2011 already and we are dusting off the website. We've decided to keep or at least try to keep a sort of a picture diary. We felt it's unfair to those who once in a while check our site. We'll try to make new entries once a week since weekends are the only days when we start feeling alive again and try to do something interesting. The remaining 5 days of each week are uneventful in this long lasting winter. After work, when we come home, it gets dark and cold quickly, so we tend to spend weekday evenings at home hibernating and waiting for the "real" spring with longer and warmer days. On this 13th day of February it's supposed to be spring in Japan. Well, it's true that the overnight frost disappeared exactly when the calendar spring came on Feb. 3rd, but 10 days later we got our first snow of the season. 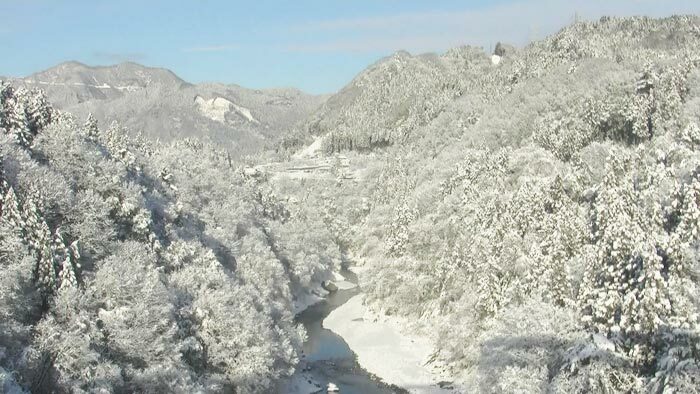 Our little town, Chichibu looked beautiful under a white snow cover and first thing we did on Friday (holiday) morning was to get into a car and drive across town to the mountains. 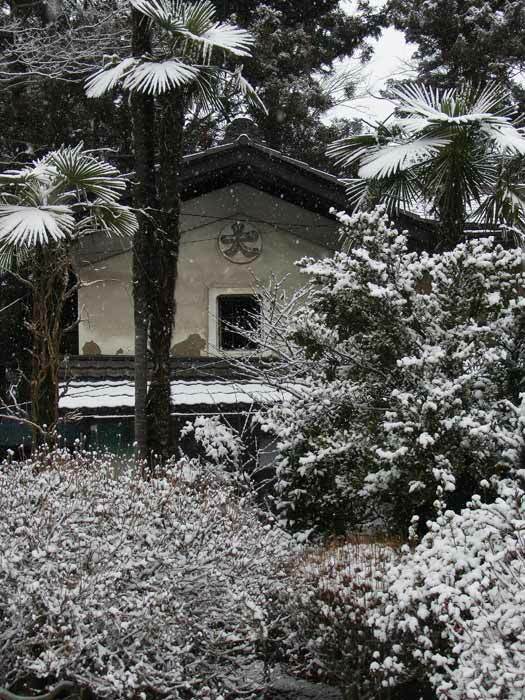 The winter scenery is always beautiful whether it is Japan, Canada or Poland, but there is something special about white winter in Japan. I could never understand what it was until today. We talked with Ewa today about how strange it is to see monkeys and snow together and she mentioned that it is strange because it's so unnatural. And then I realized that it was it. It is unnatural. 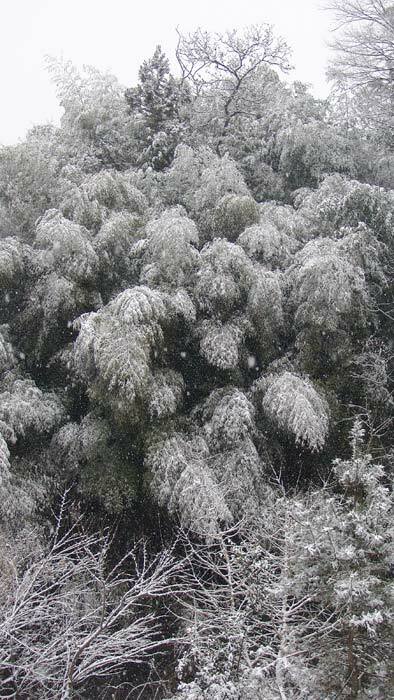 It's unnatural to see monkeys running in the snow and it's unnatural to see bamboo groves covered in snow bending so low that they sometimes touch the ground. 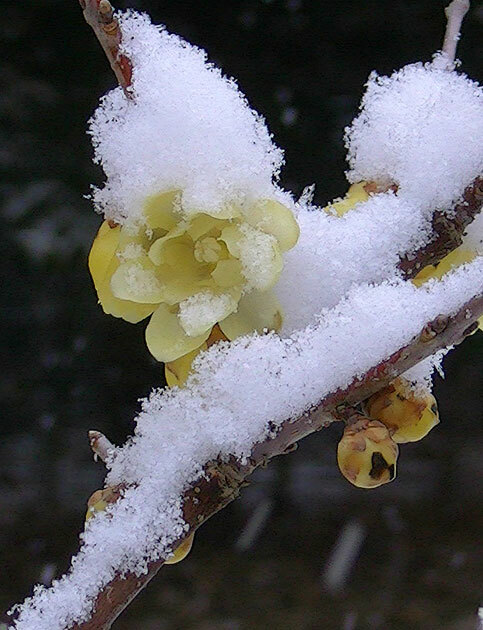 And it is unnatural to see beautiful flowers under the icy wet snow that are not really bothered by it. That's what makes it so beautiful. We hope it is not the last of it before the real spring arrives. Olek is always more than happy to go out on any day. This was special. The world outside was white. After 2 straight months of pure sunshine we got the first taste of snow. The weather in this part of Japan is affected by Pacific Ocean. 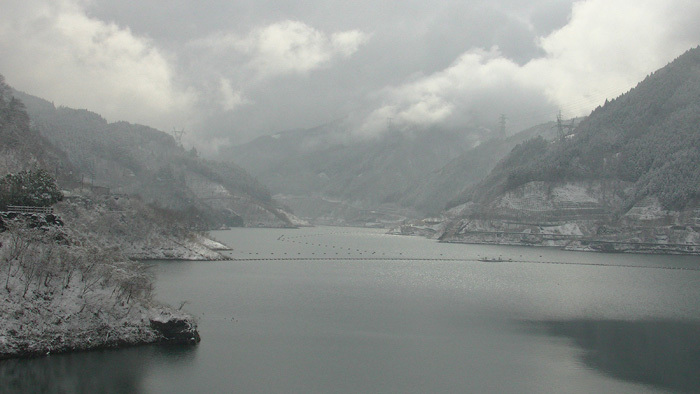 The winters here are dry and sunny as opposed to the Sea of Japan side where it snows almost everyday. When it does snow here, it happens often after the arrival of spring in February or just before in January. 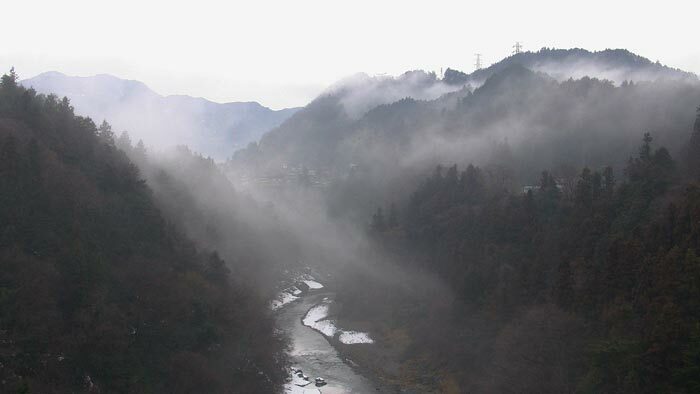 Our little town, Chichibu, is located at the foot of Chichibu-Okutama National Park. Our house is only 15 minutes away from Urayama, a small mountain village located just off the main road. It is a completely different world there with sleepy mountain hamlets that have changed only a little over the centuries. It has been our destination on the weekend and often on weekdays after work during the longer summer days for 2 years. And despite the fact that it is just around a corner, we still go there with the same enthusiasm and can never get enough of the mountains. One of the most exciting activities there for all of us is searching for wildlife. 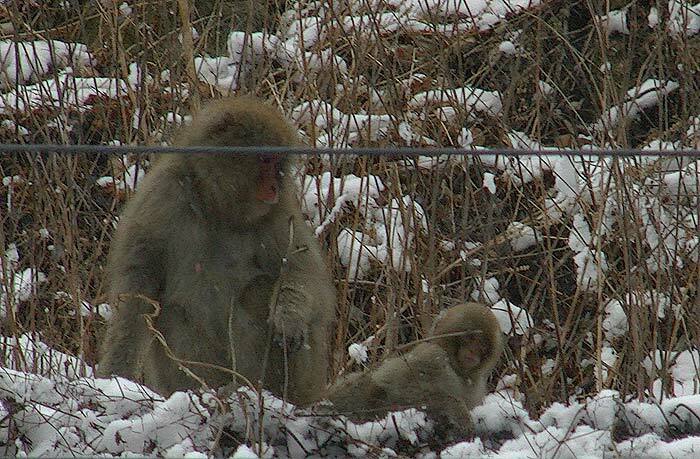 The most common are the monkeys and are usually seen in the area moving slowly between the higher slopes and the bottom of the valley always searching for a bite in the local fields. The deer is also very common. There are also wild boars and bears, but these are much more shy and prefer to spend their days hiding in the woods. When a bear does come out, the warning signs with the location and the date it was spotted, are posted in the area immediately. 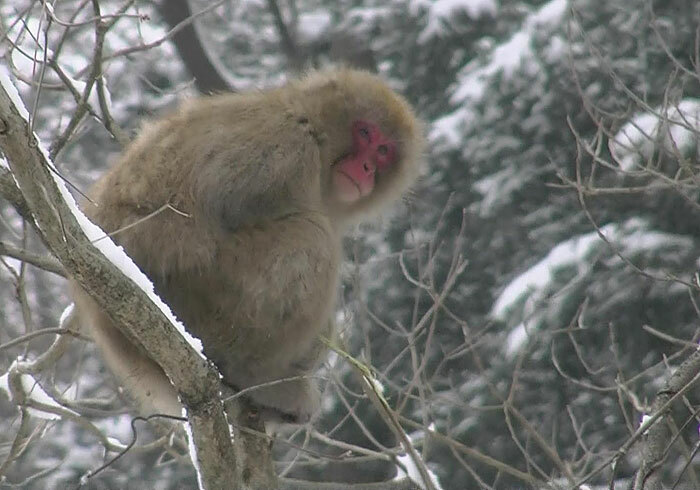 The snowfall this weekend forced the monkeys to spend a couple of days in the trees, the driest spot in the area. They seemed happy eating bark off the branches all they long. The snow in this area is always wet, sticking to the plants and making the landscape beautiful. 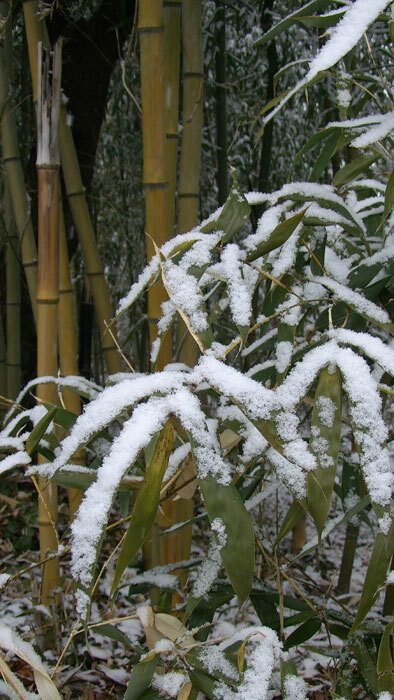 Probably the most beautiful sights are the snow covered bamboo, bending low to the ground as well as the first blooms of Japanese Allspice (ロウバイ） and Camellia flowers under the icy wet snow. They have always been a great inspiration to Japanese, Chinese and Korean poets or painters.